How do you save and keep Option settings in Creo? Re: How do you save and keep Option settings in Creo? If you right click on the Creo Parametric shortcut on your desktop, and choose Properties from the pop up menu, then you will see similar tab to the one on the following picture. There is the said "Start in" field highlighted. In this field you can just put the path where you would like Creo to fire up. Meaning where it's gonna have it's startup directory, etc. If you then put your config.pro into the same folder, you will have it loaded into Creo on it's every start up. I finally figured out! My folders just needed to rearranged. Just to add, the config that manages drawing templates folder location is named start_model_dir. What you call your Home directory is not the same directory Creo is using as your Home directory. I'm trying to coach a new user in CP4 configuration settings and the CP4 configuration editor has me befuddled. 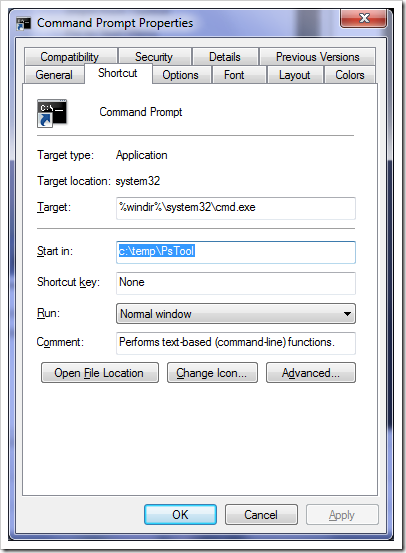 Where Creo reads configuration files has been asked an answered. Creating a new configuration file is fuzzy. In our installation, load point and start-in locations are controlled by the sysadmin. So the next logical place for personal options is %HOMEDRIVE%%HOMEPATH%\config.pro. Since he's a new user, he doesn't have any configuration files here. I can brute-force it the pre-Wildfire way with Notepad, but I have a hard time believing that's the CP4 "recommended" way. Example: He doesn't read his message area. To solve a pain point for me, I want him to have 3-5 lines show up in the message area. Expected outcome: From the Configuration Editor, create new config.pro file in the %HOMEDRIVE%%HOMEPATH% folder, containing the visible_message_lines and the desired value. Undesirable outcome: Saving the property in the loadpoint or start-in config.pro. Why? Overwritten by sysadmins. I see nothing wrong with this approach, as long as you know correct option names and their values. Config.pro is a text file, it doesn't matter what method you used to create it. If you want to export only newly added options and not all the options read to current session, simply change this Show filter to Only changed and then export configuration to config.pro. It should contain only the options you added (or modified) in current session, not all the options loaded into session. I'm still lost with all this... any & all help is much appreciated! I want to customize my Creo to a few things I want, that differ from the department. I have a created a number of Config.pro files, but none seem to get read, no matter where they're put. It would seem the last read config.pro is the one that I don't want to change, as it's the company standard one. - and if changed, I'll then need to re-set my 'working directory' each & every time I start my day. 3) The Start-In directory defined in the desktop shortcut. All files MUST be named config.pro. Any setting in config.sup ca NOT be overwritten by a config.pro setting. The last file read determines what settings are put into memory. Each user should have their own Start-in folder for the various trail files, analysis files, etc. It should not be used by other users. Trail files should NOT be written to a network file as it degrades performance. We set up a C;\PTC_User folder on each computer and then a <whatever your username is> sub folder. This is the start-in folder defined in the icon as C:\ptc_user\%username%. So, with that understood, company settings should be in the config.pro and config.sup in the /text folder. Thanks, Ben, for proving my point for me. I'd guess you are a seasoned Pro/Engineer user, judging from dates of your posts. Your response sees obvious to you, since you've been using Pro/Engineer since before PTC provided a configuration GUI. New Creo Parametric users (e.g. Millennials and hipsters - no offense intended), who are presented with the Creo Parametric configuration GUI have no chance in h-e-double-hockey-sticks of creating any of the files you described. Why provide the GUI if you can't CREATE any of those configuration files in the CORRECT folder? Why provide the GUI if you can't SAVE option changes in the CORRECT file? So even though there is a GUI now, new Creo Parametric users still have to do it the old Pro/Engnieer way.